The next time your niece asks you where 18 things come from, you may not need to worry over the quality of your answer that was snatched from a quick keyboard tap. Not if you download an extension. A regarded information source can have your back, and it is the oldest English-language general encyclopaedia. "Encyclopaedia Britannica wants people to slow down and think twice before accepting search results as facts," said the Chicago Tribune. The regarded reference source launched a free Chrome extension recently. It delivers an additional layer of information at the top right of the results page. 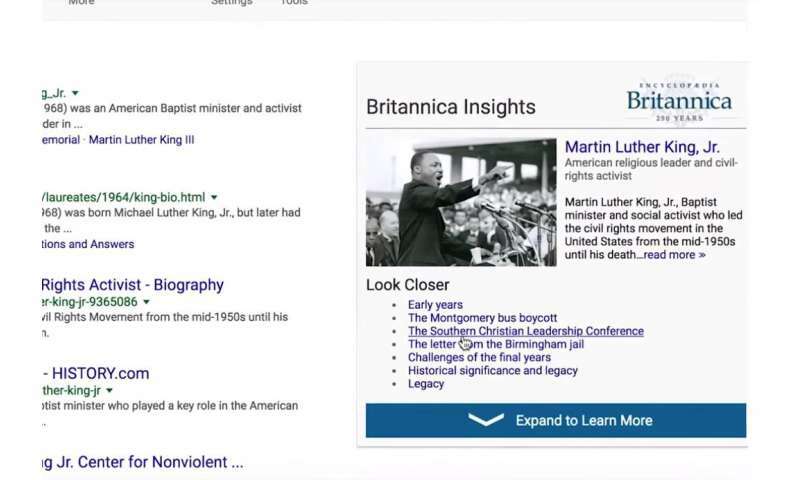 This is all about the Encyclopaedia Britannica's new Britannica Insights Chrome extension. An official announcement dated June 7 said, "The Encyclopaedia Britannica Group today announced Britannica Insights, a free Chrome browser extension that enables searchers to cut through the noise on the internet and provide trusted and verified information at the top-right corner of their search results page." "When you search Google with Britannica Insights installed, the extension will populate information from the encyclopedia above or alongside Google's own featured snippet," said Wired. "For example, next to the result from NASA, Britannica Insights displays its entry for 'Rayleigh scattering,' the technical term for the physics phenomenon that turns the sky blue. The tool works best for that sort of scientific or historical question." So, people will be using this extension left right and center to get the facts, right? Not so fast. Ally Marotti, Chicago Tribune: "Northwestern University professor Brian Uzzi, who has studied how people consume information and behave on social media, said the success of the extension will depend on whether internet users still see the company as a bearer of truth." The mere presence of this kind of entry though could bring us closer to a respect for looking critically at the instant information one is fed. "Most people don't know that Google ranks its search results on relevancy and utility. Seeing dissenting information from Britannica could start a conversation," said Marotti. In 2012, Reuters reported that the oldest English-language encyclopedia still in print was moving into the digital age. According to Reuters, the encyclopaedia said "it will end publication of its printed editions and continue with digital versions available online." The focus is as a digital media company with knowledge and learning products for homes, schools, libraries and workplace. "The media we work in may have changed, but our mission has not," said Karthik Krishnan, global CEO of the Britannica Group. Krishnan was quoted in Wired. "We don't say Britannica is the only company providing verified information. The world needs to know that there are multiple sources to get good information." Online information has its pitfalls of unverified information, as well as rogue entries and "digital vandalism." Krishnan raised another instance where you might walk off with the wrong answer. "On user-generated content sites an answer could be right today and wrong tomorrow because of warring factions trying to slant information to benefit their own agendas." Wired commented favorably about Britannica Insights for historical topics. A look up for the French Revolution, for example, "gives you a list of links to key events, people, and topics—handy resources any time-crunched student would appreciate. "